This book is a collection of historic and repeat photographs of the landscapes, forests, villages, glaciers, and people of the Mount Everest region of Nepal over the post 65 years. Most of the historic photographs were taken in the early 1950s by the first western explorers, climbers, scientists, and cartographers to the Khumbu region, which I have been replicating in the course of my work and research in the Khumbu over the past 30 years. In doing so, a fascinating collage of change emerges that has taken place in the interim, much of it good, some of it unanticipated and uncertain. The purpose of the book is to capture a record of this change that otherwise would be lost, especially for the younger generations of Sherpa people who, in spite of the Khumbu region's relative remoteness, are growing up in a world far, far different than that of their parents and grandparents. Over the past several decades, my career has taken me dozens of times to the Khumbu in search of answers to a constant stream of research questions, such as: how have forests and grasslands changed over the past several thousand years, five hundred years, and 50 years? Why were hillslopes and vegetation in the alpine zone so disturbed com- pared to the forests and shrub-grasslands below? What community-based methods could help to protect these fragile mountain ecosystems? How can the pressures of climbing, trekking, and adventure tourism be better managed, reduced, or eliminated? What were the impacts of climate change in this high mountain region? How quickly were the glaciers receding, and new glacial lakes forming? How could communities reduce the risk of glacial lake outburst floods? What were the impacts of the April, 2015 earthquake on the region's glaciers and glacial lakes? Insights to each of the above questions came from the dozens of research expeditions to the region that I've led over the years, some of which lasted a full year or more. Others were provided through the a range of conservation, educational, and community development projects that I've had the privilege to lead or co-manage, generously funded by various donors that have included the National Geographic Society, National Science Foundation, U.S. Agency for Inter- national Development, American Alpine Club, International Centre for Integrated Mountain Development, and United Nations University. Field methods included geomorphic techniques to quantify soil erosion from hillslopes; pollen analysis and 14C dating of buried charcoal to reconstruct vegetation cover over the past 5,000 years; transects to determine groundcover in the alpine and types of disturbance; interviews and community consultations; bathymetry, ground penetrating radar, and discharge measurements of glacial lakes; remote sensing; tree ring analysis; vegetation analyses; fuelwood use measurements; and analyses of adventure tourism impacts on the trails, base camps, and alpine ecosystems of the region's trek- king and larger climbing objectives. In nearly every case, repeat photography provided valuable additional insights to the more quantitative mrthods listed above. It can also provide an extremely effective educational tool that quickly and dramatically illustrates changes in glaciers, forest cover, and cultural landscapes over time. The technique itself is simple: find an older photograph, or series of photographs over time of a landscape, glacier, or village. Find the precise photopoint used by the original photographer, and replicate the historic photograph as accurately as possible in terms of identical season, time of day, weather, and camera equipment (using identical lenses o the original photographer is hardly ever possible, but good substitutes can be made with modern equipment and Photoshop techniques). 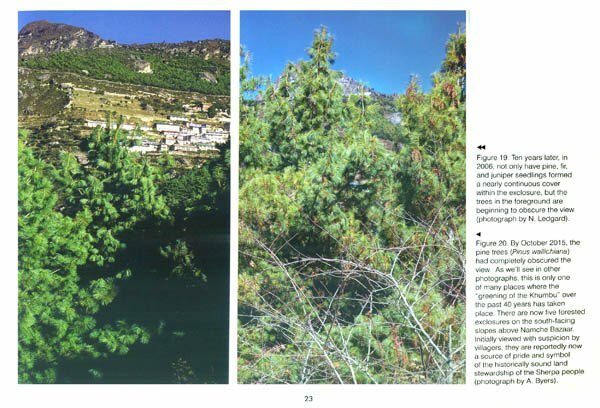 If what appear to be changes between the two photo pairs are apparent- e.g., changes in forest or ground cover- ground truth verification is critical to the most accurate understanding of events or processes leading up to that change, usually by establishing sampling plots in the area of question. Oral testimony from local residents can add tremendous insights to when, why, and how the changes occurred. Literature reviews, especially of older books written by the early scholars, climbers, and scientists to a region, can be an extremely valuable resource as well as a source of additional historic photographs. Time lapse satellite imagery and aerial photography can provide additional insights as to changes that have large-scale deforestation, and other large- scale features. 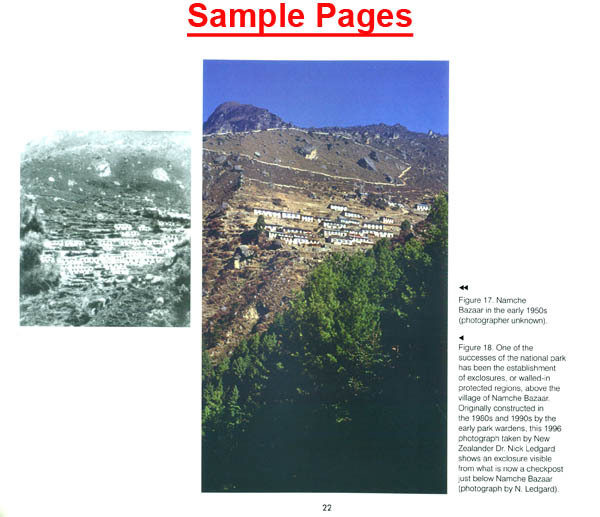 The older photographs that I used included, with permission, those of Namche Bazaar taken by Dr. Charles Houston in 1950, member of the first western group to visit the region in search of a southern route to Mt. Everest. Others include those of Sir John Hunt taken during the 1953 British Everest expedition; by Sir Charles Evans, Deputy Director of the 1953 British expedition; the Austrian climber-cartographer Erwin Schneider's landscape and glacier panoramas from 1955, taken in the course of making the beautiful Alpenvereinskarte map of the Everest region; the Swiss-Canadian glaciologist Fritz Muller's photographs of the Khumbu glacier and his Sherpa staff in 1956, following the successful 1956 Swiss Everest expedition; the Austrian geographer and alpine researcher Helmut Heuberger, a member of the successful Austrian Cho-Oyu expedition led by Herbert Tichy in 1954; the New Zealand forester Dr. Nick Ledgard, who since 1989 has assisted The Himalayan Trust and Sir Edmund Hillary Foundation of Canada in their reforestation projects in the Khumbu; New Zealand protected area specialist Bruce Jeffries; and mountain scientist-climber Rodney Garrard. Additionally, several of my own first photographs of the Khumbu region are now “historic” as they were taken in 1973 during my first visit to Nepal, and in me cases now provide valuable documentation, of the tremendous change brought about from tourism and other factors since that time. But the real beginning of my passion to ph tographically document change began 1984, when my wife and I lived for nearly year in Khumjung village while I conduct the fieldwork for my Ph.D. from the Department of Geography, University of Colorado at Boulder. Daniel Vuichard, a Swiss geologist and colleague, gave me a collection of landscape photographs taken by EIVI Schneider in 1955. They were of particular importance because I knew that they could provide a window into the recent past, and possibly remove some of the uncertainty regarding the "crisis" that was said to be occurring throughout the Himalaya in the form of unprecedented forest loss and accelerated soil erosion. That is, during the 1970s and early 1980s, it was commonly assumed that the Himalayas were approaching catastrophic levels of environmental degradation, link, primarily to growing contemporary hum and cattle populations. First championed Erik Eckholm of the World Bank in his book "Losing Ground," landscapes throughout the mountain world were said to be experiencing unprecedented increases in deforestation, overgrazing, and the terracing of marginal land. In turn, these phenomena were claimed to be responsible for promoting near-crisis levels of fuelwood shortages, soil erosion, slope instability, geomorphic hazards, and major watercourse siltation. Catastrophic consequences were predicted within 20 years. Although supported by little quantitative or long-term data, a widely accepted paradigm for the international development community was established that became the foundation for dozens of multimillion dollar conservation projects throughout the Himalaya-Hindu Kush region. These well-meaning projects were typically designed to "reverse the trends of environmental degradation" through afforestation, the introduction of simple but "appropriate" technologies such as improved cook stoves, alternative sources of energy, and improved land management techniques. By the mid- 1980s, the conventional wisdom driving these popular perceptions was isolated and synthesized into what ultimately became known as the "Theory of Himalayan Degradation" spearheaded by mountain geographer Professor Jack D. Ives. The growing uncertainty resulting from the small and often contradicting data base in support of development projects began to be highlighted, and the soundness of formulating management policy on popular and subjective assumptions questioned. Paralleling the development of "Theory of Himalayan Degradation," the Sagarmatha (Mt. 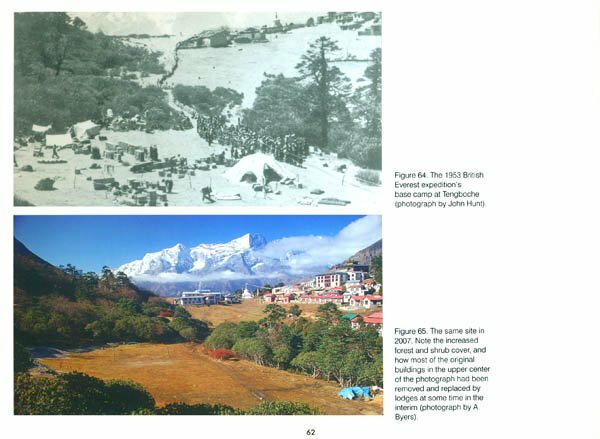 Everest) National Park, Khumbu, Nepal was frequently cited as a representative case study of historical landscape stability, followed by contemporary landscape change and degradation, in the High Himalaya. Historically, this interpretation maintained that major landscape trans- formations (i.e., the large-scale conversion from virgin forest to shrub/grassland on most south-facing slopes) were the result of 500 years of settlement, population growth, and pasture expansion by the ancestors of the Sherpa people; but that ecological stability nevertheless predominated because of the effectiveness of indigenous management systems. Contemporary issues such as increased forest loss, uncontrolled grazing, and accelerated soil erosion were believed to have been encountered and/or exacerbated only since the late 1950s. 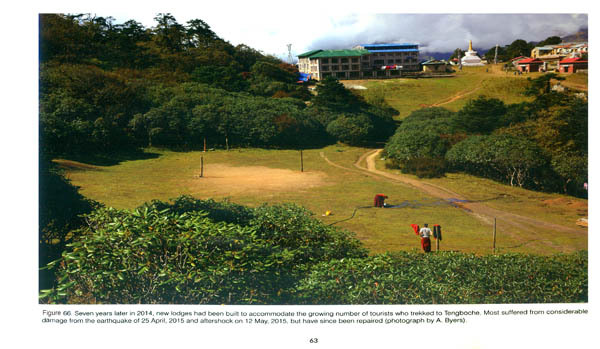 Factors of influence, according to most studies, included the imposition of nationalized forest policies in 1957, the consequential breakdown of traditional indigenous management systems, impacts caused by Tibetan refugees who arrived in the early 1960s, misunderstandings associated with the park's establishment in the 1970s, the rapid growth of tourism, and various other factors. 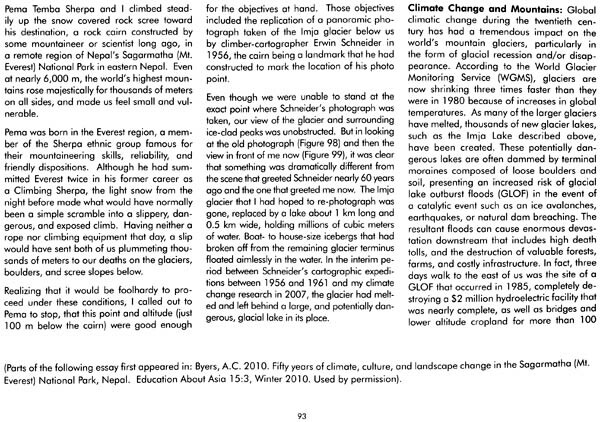 Challenges to the Sagarmatha National Park "degradation scenario" began to emerge in the late 1980s with the completion of more detailed, longer-term studies of the park and its people, including my own research on soil erosion; the landscape change work of Stan Stevens; and the animal husbandry studies of Barbara Brower. Geographers, anthropologists, and others have since played key roles in the clarification of human disturbance and landscape change processes in the Khumbu and elsewhere in the Himalaya, utilizing a range of field tools and methods from the social and physical sciences. For example, by analyzing pollen from soil profiles between Thame and Lobuche; dating the bits of charcoal found at various depths; and identifying the species of each piece of charcoal, I was able to re-construct the vegetation history of the Khumbu valley over the past several thousand years-and the results were surprising. In brief, the conventional wisdom of the time claimed that the Sherpa were the valley's first inhabitants, beginning with their immigration from Tibet some 500 years ago. Our data,' however, suggested that people had been visiting and burning the forests on the south-facing slopes of the region for more than 5,000 years, most likely in an effort to create grazing land for their cattle. What the original Sherpa inhabitants saw when they first entered the Bhote Kosi and Imja valleys was most likely far from the continuous cover of cloud forest that the botanist George Meihe believes was the "potential" natural vegetation of the region, but probably vegetation formations not too different than those seen today-shrub-grassland on the south-facing slopes, and fir-birch-rhododendron on the north-facing slopes. 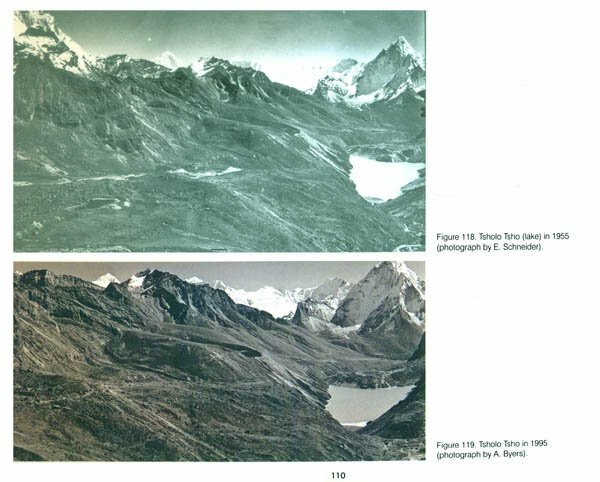 The Schneider photographs, of course, offered a unique window into the more recent past, and by replicating those given to me by Daniel Vuichard in 1984 I was able to develop my own case against the "Khumbu Theory of Himalayan Degradation," which I recorded in my doctoral thesis. In 1995 and 2001, with support from the National Geographic Society, and armed with more of the Schneider photos from the archives of the Austrian Alpine Club in Innsbruck, I spent nearly two months in the Khumbu retracing Schneider's footsteps to produce a much more detailed collection of repeat photographs than I had been able to complete in 1984. As described in Chapter 2, "Changing Glaciers," my next big windfall came when my advisor in graduate school, Dr. Jack D. Ives, sent me a box filled with the 1956 photo- graphs of the Swiss-Canadian glaciologist Dr. Fritz Muller who lived for 9 months in the vicinity of Gorak Shep after the successful 1956 Swiss Everest expedition. Although amazingly fit as a young man (he once sent a post card to Jack written at the South Col, while helping the expedition's high altitude Sherpas carry loads to the climbers), Muller died of a heart attack in 1980 at the age of 54 on the Rhone glacier in Switzerland while leading a field trip for journalists. Although most of his Khumbu photographs and data were lost, one of Muller's graduate students, Dr. Konrad Steffen, managed to salvage a box of black and white prints (all negatives had apparently been destroyed) that he brought with him to the University of Colorado at Boulder when he became director of the Institute for Research in Environmental Sciences (ClRES) in 2005. Ives, always generous with his own photographs and archives, sent the box to me sometime later. In it I discovered not only a treasure of glacier photographs taken by Muller in 1956, but also a set of taped-together glacier panoramas taken by his friend Erwin Schneider the previous year, as well as a collection of photographs taken by Dr. Charles Evans, deputy director of the 1953 British expedition. I spent the fall of 2007 retracing the footsteps of all three "climber-scientists," retaking their ca. 1950s photographs, usually (but not al- ways) from the same precise photopoint. The results were featured in an ICIMOD-funded European photo exhibit in six different cities, with several of the old and new panoramas enlarged to the size of small billboards, and a smaller version was displayed at the Everest base camp in 2008. Since 2007, the photos have also been featured in dozens of press releases, films, books, and publications, providing a unique and easily understandable display of the undeniable impacts of global warming and climate change. Because of their unique nature, it was tempting to include dozens and dozens of photo pairs within this book even if the changes in landscape they illustrated were somewhat subtle. However, the final selection was usually governed by a set of criteria I developed that emphasized clarity and ability of the reader to detect change, be it vegetative, geomorphic, or cultural, mostly in the interests of ensuring enjoyment and the promotion of discussion. As mentioned, most of the repeat photographs were taken from the same photopoint as used by the original photographers. It wasn't that difficult finding the majority of the photopoints, especially since my guide, Pema Temba Sherpa, and other Sherpa friends met along the way were particularly knowledgeable about the Khumbu landscapes. But the precise location of some still remain a mystery because, try as I may, I just couldn't find them. 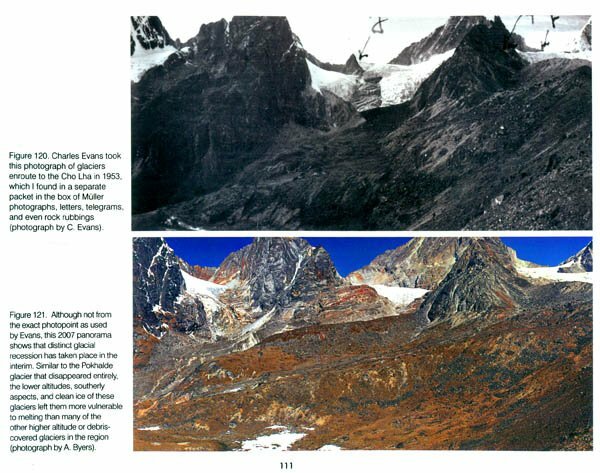 But just as popular passes, such as the Mingbo La from the Khumbu into the Hongu valley, become impassable because of avalanches and landslides, perhaps some of the original photopoints were destroyed by similar processes as well. Snow and safety conditions prevented the re-location of several others, as it just wasn't worth the risk to carry on. Although in most cases the locations of the photographs and names of mountains have been easy to identify, it was extremely difficult to identify the people from the ca. 1950s photographs. Most Sherpa did not possess cameras in the 1950s, and family photographic archives are generally scarce for this particular time period. Plus, 1950 was a long time ago, and many of the people shown in the old photographs, notably Fritz Muller's staff who lived with him for nine months in the vicinity of Gorak Shep, are no longer alive. Finally, although I spent most of June, 2015 in the Khumbu conducting an assessment of the impacts of the 25 April, 2015 earthquake and 12 May, 2015 aftershock on the region's glacial lakes, I do not include photographs of the damage caused to many of the structures shown in the book. We were far too busy to try and obtain replicates of the older photographs, and besides nearly all of the buildings, trails, and other structures so heavily damaged have now been completely repaired. The Khumbu is once again among the most beautiful, hospitable, and safest mountain regions in the world, and it's time to move on from the trauma caused by the earthquake. It is my sincere hope that this book will be enjoyed by both Sherpa and Everest region aficionado alike, the latter including trekkers, climbers, scholars, and naturalists. It certainly has been fun creating, with each photo pair evoking fond memories of the hundreds of days and thousands of kilometers spent in the field retracing the footsteps of the early climbers, scientists, and explorers. 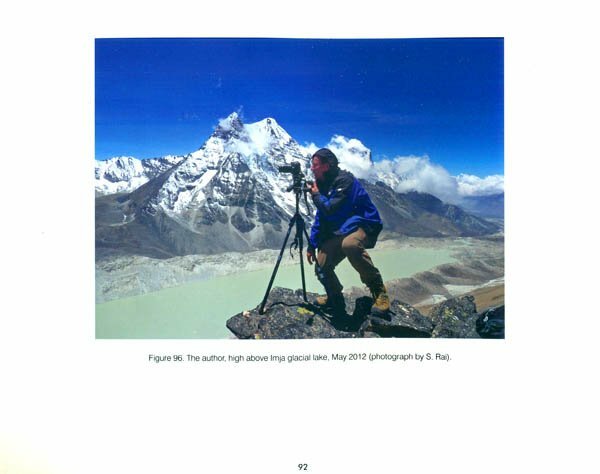 In the interim, a new generation of professional Sherpa photographers and scientists has emerged; perhaps they will produce a sequel of this book using their own repeat photographs in the years to come.